Tampa Bay Film Festival Reviews - Reviews of film festivals also include coverage and interviews. - Tampa Bay Film - The voice of Tampa Bay independent film. Reviews of film festivals, primarily film festivals in the Tampa Bay area which focus on independent films. Reviews of film festivals also include coverage and interviews. Film festival reviews are listed in the order of publication, with the newest review at the top, with the exception of our older archived film festival reviews, which will be listed below those if published afterwards. 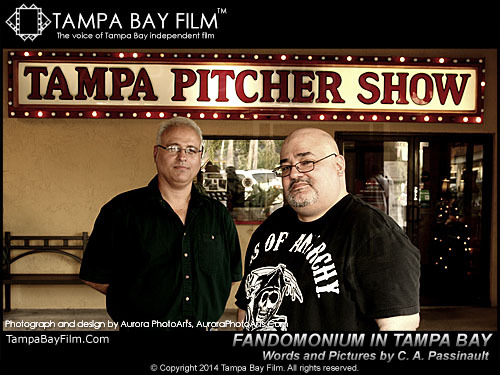 Tampa Bay Film editor C. A. Passinault made a second journey to visit the Tampa Pitcher Show to experience the first Fandomonium in Tampa Bay event and film festival on Sunday, June 22, 2014. This review, exclusive to Tampa Bay Film, contains cool pictures, video clips, and a review of the event and some of the independent films. After a five year hiatus, Rick Danford finally resurrects the legendary Halloween Horror Picture Show, and the film festival is set to screen on September 28, 2013. Tampa Bay Film editor C. A. Passinault literally gets lost finding the out-of-sight venue as he investigates the beginning of a new chapter. This review, a Tampa Bay Film exclusive, contains videos, pictures, and, of course, a review of the film festival event. This is the official review section on Tampa Bay Film for film festival reviews. Although, technically, film festivals such as the Gasparilla International Film Festival (GIFF) and the Sunscreen Film Festival ARE film festivals, we do not feel that they support independent film as much as they should, and, as such, do not classify them as true independent film festivals. It is our opinion that they serve to market the Tampa Bay area for outside productions to make movies here, and/ or to sell overpriced filmmaking workshops which have little relevance and value to independent filmmakers, respectively. It is our opinion that they are pretentious, overpriced, arrogant movie premiers which try too hard to “be like a Hollywood red carpet event or premier”, and we think that they are jokes which are ultimately ineffective to independent filmmakers. As a result, we are not very inspired to attend those film festivals or to spend a lot of time reviewing them, although we do have opinions and will continue to be critical of them, as all independent filmmakers should (We are considering publishing reviews of these film festivals, even if we haven’t or won’t attend them. If we do, we will admit that we did not attend them in the reviews, and will write the reviews from research). It is also our opinion that the people of the independent film scene and the talent should be ashamed to support these so-called “film festivals”, if they do, in fact, do so. It is our opinion that these so-called film festivals should be boycotted and ignored. You will find reviews here of true independent film festivals, film festival for independent films and the maverick independent filmmakers behind those films. These film festivals include, but are not limited to, The Saints and Sinners film festivals, Horror and Hotties, the Coffeehouse Film Festival, The Slime Serpent film festival, the roundtable of independent film film festival, Ladies of the Night, The Halloween Horror Picture Show film festivals, the Rise of the Dead zombie film festival, Fandomonium in Tampa Bay, The Sunburn Film Festival underground film festival and peer group review, The Tampa Bay Film Online Film Festival (OFF), The Tampa Bay Film Showcase monthly film festival and professional networking event series, The Reverence Film Festival, The Revolution Film Festival, and more. To a lesser extent, as it is our opinion that they are at the bottom of the barrel of the definition of independent film festivals, and were deeply flawed, as well as failures, this also includes the Tampa Film Review and the Coffeehouse Film Review monthly film festivals. © 2013-2016 Tampa Bay Film. All rights reserved.